Elisabeth Bergner was the daughter of the merchant Emil Ettel (1867-1935) and his wife Anna Rosa Wagner (b.1873). She grew up in Vienna. Her parents divorced in 1913. Elisabeth made her theatre debut in Innsbruck in 1915. In 1916 she obtained a contract in Zürich, where she played Ophelia next to the famous Alexander Moissi, who fell in love with her. She rejected him as a lover (allthough she liked him very much and it seems she played with his feelings). The next stage in her career was Vienna, where she posed as a model for the highly talented but deeply unhappy sculptor Wilhelm Lehmbruck. Lehmbruck fell madly in love with her. She rejected him and his suicide soon afterwards shocked her. After performing in Vienna and Munich she came to Berlin in 1921. 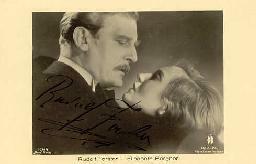 There she played in productions by Max Reinhardt and became a very popular actress. During her early years as an actress she was often helped by the poet and critic Albert Ehrenstein, whom she called "Xaverl". Ehrenstein was also in love with her. At one time she promised him a child, but she soon changed her mind or never had such an intention at all. Ehrenstein wrote numerous poems for her, but often she kept him at a distance. However, their friendship lasted and they continued to exchange letters. In 1923 she made her film debut in "Der Evangelimann". In 1924 Paul Czinner gave her a role in "Nju". This was the beginning of a succesful collaboration in professional as well as private life. Her most successful silent movie was "Fräulein Else" (1928). Bergner and Czinner were both Jews and after the Nazi's came to power they emigrated to Vienna and then London, where they were married allthough Czinner was gay. She learned English and was able to continue her career. In London she befriended G.B. Shaw and J.M. Barrie, who after a long pause started writing again, especially for her. The resulting play, "The Boy David" (1936) was not succesful. She also appeared as Gemma Jones in the movie version of "Escape Me Never" (1935) by Margaret Kennedy, which earned her an Oscar nomination for Best Actress (Bette Davis won that year). Her movie "Catherine the Great" (1934) was forbidden in Germany. During her London years she sent much of her money to relatives and friends in need. Among them Ehrenstein, who never seemed able to make any money for himself and always needed her financial assistance. Bergner's only Hollywood movie "Paris Calling" (1941) failed to attract attention. On Broadway she was more succesful in "The Two Mrs. Carrolls". This was probably the inspiration for Mary Orr's story "The Wisdom of Eve" that was turned into the movie "All About Eve" in 1950. After the war she worked in New York until she returned to England in 1950 and continued to live there. She gave much acclaimed bible readings in Israel in English, German and Hebrew. Back in Europe she resumed her stage career in Germany and in 1959 she stunned audiences and critics in Berlin with her performance in "Geliebter Lügner", a German version of Jerome Kilty's "Dear Liar", a play based on the letters exchanged between G.B. Shaw and actress Stella Campbell. In 1961 she also returned to the movies and in 1970 she debuted as a director. Her last stage appearance took place in 1973 (Paul Czinner had died in 1972). In 1978 a volume of memoirs was published in which she shared some of her secrets with the public, like Wilhelm Lehmbruck's surprising obsession with her, but certainly not all of them. She tells the reader of a silent walk with the actor Hans Otto but not of her affair with him and she is also silent about Paul Czinner's assumed homosexuality. In 1979 she received the Ernst-Lubitsch Prize and in 1982 the Eleonora Duse Prize Asolo. 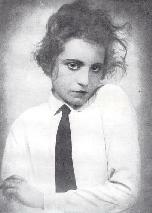 She discussed a possible return to Vienna with Bruno Kreisky, but she died from cancer at her home in London in 1986. 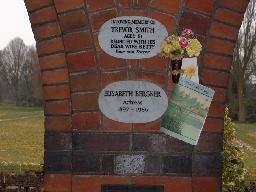 In Seglitz (Berlin) a city park was named after her. 14/12/1936 London Premiere of "The Boy David" by J.M. Barrie. At His Majesty's Theatre. Barrie hadn't written a play in years but he wrote this one after he had met the Jewish actress Elisabeth Bergner, who had fled Germany for nazis. The play was unsuccesful. 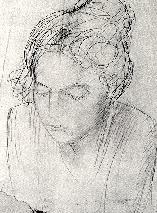 'Mädchenkopf' (Elisabeth Bergner) by Wilhelm Lehmbruck. Elisabeth Bergner as "Fräulein Julie" (1922). The memorial plaque for Elisabeth Bergner at Golders Green Crematorium, London. Rudolf Forster and Elisabeth Bergner. Elisabeth Bergner in "Dreaming Lips".